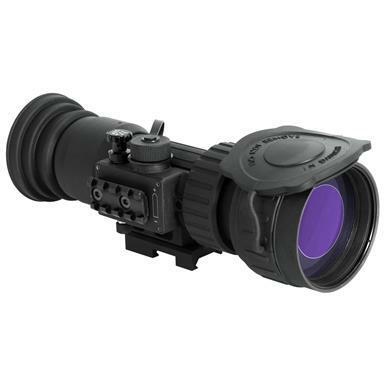 ATN® PS28-CGT Night Vision Day / Night Clip-on System. Enhanced, better-than-Gen 2 performance to give your scope 24/7 mission capability. NO re-zeroing, NO change of eye relief, NO shift-of-impact... The PS28-CGT mounts in front of your daytime scope in seconds to provide Gen 2+ high-quality imaging. 100% waterproof and built to military specifications, the unit's quick-release rail mount attaches and detaches quickly and easily, effectively making you a 24/7 predator. The particular version of the PS28 utilizes a CGT image intensifier tube. CGTs are engineered for significantly enhanced performance over current 2nd generation IITs. The CGT IIT is a multi-alkali, compact 18mm format, MCP image intensifier... sensitive in a wide spectral band, delivering good contrast in all light conditions. Hog hunters, LEOs, security forces -- if you're looking to expand your scope's capability for a moderate price, look no further. Battery life: Up to 50 hrs. Dimensions: 7.3 x 3.4 x 3.3"h.